Tuscan dinnerware and Deruta Italian ceramics - made by Italian master potters & hand decorated with antique majolica patterns. Use Tuscan plates to create a Tuscany look in your home! Check out ALL Tuscan & Tuscan style dinnerware sets here ! Majolica dinnerware (the Italian spelling is maiolica) is dark earthenware covered with a white tin glaze and decorated with colorful patterns or images, including historical or mythical scenes (called istoriato ware, 'story' pottery). No one knows with absolute certainty where the name "majolica" comes from. The most convincing explanation I have come across is that this type of Tuscan dinnerware first came to Italy from southern Spain, via the island of Majorca. Many people thought the pottery had been made in Majorca, and so it ended up being named, in a slightly garbled fashion, after the island. However, names aside, the real origin of what is now called majolica pottery goes much further back. Tin-glazed pottery was first developed in the Middle East, before or during the 9th century. Then Arab/Berber conquerors (the 'Moors') brought the craft to Spain in the early Middle Ages. In Spain, potters perfected a glazing technique that added a metallic sheen to the finished product (you can see it well in the photo above left). This "lustreware" was a great success with Italian importers, and many wealthy Italian families commissioned their own majolica dinnerware designs in Spain. The photos above and to the right show details of 15th-century Spanish-made ceramics. Interestingly, though, majolica production was already well established in Italy at this time. The main artistic 'hotspots' were - and still are - in central Italy, especially the area around Florence (Montelupo , Deruta & Gubbio ). These comparatively small towns produced an awe-inspiring amount of very sophisticated Umbrian & Tuscan dinnerware. Beyond that, Renaissance majolica workshops were scattered as far north as Turin, Venice and Padua, and some as far south as Sicily. 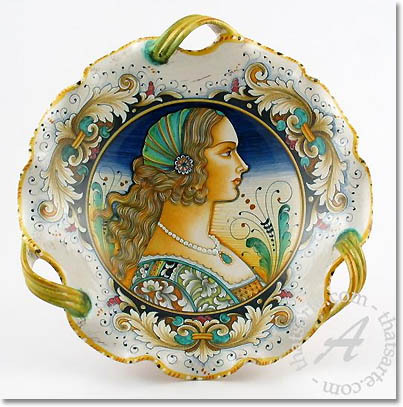 By the way, you may have come across the term 'faïence' - this is exactly the same as majolica pottery, but with a 'Frenchified' name, derived from the northern Italian town of Faenza. Faenza was a center of majolica production in the late Renaissance; it exported tin-glazed wares (and leaked the secrets of the craft) to France and further north, across Europe and to the British Isles. The photo left shows a collection of footed bowls in Assisi, Umbria. The most recognizable majolica pattern in this group is the "Raffaellesco" design (on the two bowls at the back); it is one of the most sought-after styles of Deruta Italian ceramics. For this reason, you'll come across a lot of tourist tat sketchily decorated in this manner, and it can be hard to find really well-executed Raffaellesco pottery. The difference between high and low quality is most obvious in the red bowl (depicting a hunting Renaissance nobleman) - it's easy to see, even without the close-up photo I forgot to take (duh!). Quality issues are not the only thing to consider when you buy Tuscany dinnerware or Deruta dinnerware. Due to the popularity of Umbrian & Tuscan plates, there are loads (and I mean loads) of fakes in circulation. Just visit a web auction site and type "Deruta" into the search box. You'll be crawling out from under an avalanche of "handmade" "Deruta" ceramics, on offer for a few dollars each. Many pieces even have 'Made in Deruta' or 'Handmade in Deruta' signs written (or printed) on the back. Do make sure you read the fine print! You don't want to find out later that your prized possession, your "hand painted" Deruta plate, was not hand painted at all - but cheaply mass produced with a decal. Or that it wasn't made in Deruta ... or even in Italy ... because it was shipped in from China or Eastern Europe, to be sold to unsuspecting tourists. 2. you're not being offered the real thing. are passionate about authentic, hand painted Italian ceramics (and very protective of the 'Made in Italy' label). Now to one last issue that you need to know about if you're going to own Tuscany dinnerware: While all majolica dinnerware here is food safe, this cannot be said generally of majolica pottery. The glaze on traditionally produced majolica pottery may contain lead. Lead is a poisonous heavy metal that is particularly dangerous to young children. Even at very low exposure rates, it can do irreparable damage to their brain development and their nervous system. I won't go into the unpleasant details here, but please make sure that you only use Tuscan style dinnerware in your household that has been certified (by a credible body) as safe for food use. If you're not sure whether the glaze on your Tuscan dinnerware contains any lead, then don't use this tableware to eat or drink from, and don't use it for serving hot or liquid foods. If you would like to put it to use in a Tuscan style kitchen design, it's safe for storing dry goods that will be peeled - or washed thoroughly - before they're eaten. The most basic type of Tuscan dinnerware is brown earthenware in simple shapes and with a transparent, colorless glaze to liquid-proof the body. ... but you'll come across similar pieces in all Mediterranean countries. The down-to-earth material is perfect for interior decorating Tuscan style, particularly when you're looking to create simple, country-style Tuscan interiors. 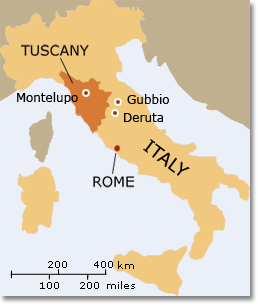 Historically, Tuscany was never a rich part of Italy (with the exception of cities like Florence or Siena). Most Tuscans used to scrape out a living on their own small parcel of land. This is the type of Tuscan dinnerware they would have owned. But even if you're going for a more ornate Tuscany look, terracotta is a color that can help you tone down and 'ground' stronger colors in the room. Tuscan style dinnerware (really, any Italian majolica dinnerware) can impart a lot of character. A row of majolica pitchers or Italian/Tuscan plates will make all the difference to an otherwise plain Tuscan dining room. a) Complement rustic Tuscan dining room furniture by displaying your Tuscany dinnerware on a traditional wooden hutch. b) If your dining room is more on the modern, white-box side, Tuscan style dinnerware will add a new dimension to it. Even if you display just a few pieces of 'Renaissance' majolica on a ledge along the wall, like museum pieces, their lively colors and patterns will lift the whole room and give it more depth. c) A large Umbrian/Tuscan platter always looks amazing when you hang it above a doorway. Combine one or two fine Tuscan plates with a collection of simple (smaller and larger) glazed earthenware plates in single colors, to enhance the 'wow factor' of your showpiece(s). d) A Tuscan style dinnerware plate , bowl , or jug will also make a magnificent centerpiece on the dinner table. For best effect, cover the table with a heavy off-white linen tablecloth or use a single-color runner. This will focus everyone's eyes on the 'star'. e) Group several Tuscan dinnerware plates together on a wall. If they're roughly the same size, you could arrange them along straight lines. f) For a more informal atmosphere, compose a cluster of colorful Italian crockery in a variety of sizes. a) Store napkins and other dining paraphernalia in Tuscan kitchenware jars or in pretty bowls , and keep some of your cooking implements at hand in utensil holders . b) Display fruit, nuts, treasures from nature on hand painted Tuscany dinnerware. c) Flowers and fresh herbs live happily in Tuscan dinnerware mugs (or in a small vase ). d) Rustic, basic terracotta pots and plates go beautifully with rough woven baskets and can inject earthiness into even the coolest environment. Fill them with fruit, or cakes for dessert (as in the photo above - that's Tuscan dinnerware in a farmhouse near San Gimignano). Seeing as Tuscan style dinnerware is often colorful and vividly patterned, I suggest you use it with restraint. Beware of a 'Tuscan overkill' with patterned Tuscan fabrics, vivid wall colors, and majolica pottery everywhere. The original kitchens and dining rooms that I've seen in Tuscany were all decorated in subdued, multi-layered neutrals with just a few splashes of color and pattern. When it comes to Tuscan style home decorating, too much color is the sign of an amateur. ... if you're using a complete set of Tuscan dinnerware for the meal, set it on a bare wooden table, or on single-color placemats / a single-color tablecloth. ... if your kitchen or dining room has colored and/or patterned walls, combine just a few pieces of Tuscan style dinnerware on the table with heavy, white Italian porcelain. ... use pieces of majolica pottery as visual accents in no more than two places in a room (for example table/wall, above-the-lintel/sideboard). Otherwise, the room can end up looking too busy. At the beginning of the 18th century, after many attempts to replicate Chinese porcelain in Europe, the first high-quality porcelain was produced in Meissen, Germany. A few decades later, in 1749, Thomas Frye obtained a patent for bone china in England, a porcelain that was made by adding bone ash to the clay mixture, and that was bright white, translucent, and strong. This delicate, elegant, new stuff quickly replaced tin-glazed earthenware in the prominent households of Europe. Some had their own sets designed with their family's monogram or coat of arms. Tuscan dinnerware was no exception. From the 1800s, majolica was on the way out, and wealthy Tuscans were displaying fine bone china collections in their palazzi (here's an example from Volterra). Mass production soon made white porcelain affordable for the middle classes, and the workshops that had been providing traditional Tuscan style dinnerware for centuries went out of business. Maybe you've come across 'Royal Tuscan' fine bone china, and wondered whether - even though you'd never heard of a king of Tuscany - 'Royal Tuscan' may be a special type of original Tuscan dinnerware? It isn't. "Tuscan" was the 19th-century trade name of RH & SL Plant, porcelain manufacturers in north Staffordshire, England. The company was sold to the Wedgwood Group in about 1970. Wedgwood then changed the trade name to "Royal Tuscan Fine Bone China". Royal Tuscan fine bone china is not produced any more, but you can occasionally find vintage pieces online. For more decorating ideas with Tuscany dinnerware, check out the section on Tuscan plates! Add pizzazz to your Tuscan dining room and Tuscan style dinnerware with matching Tuscan candle holders. Whether you prefer Renaissance majolica designs or contemporary majolica dinnerware, there's likely to be a kitchenware or serveware collection to go with your Tuscan style dinnerware set! Check out the colorful Tuscan canisters, too! Tuscan style canisters & jars are a lovely asset for a Tuscan dining room, Tuscan style kitchen design, or to create a 'Tuscany look' anywhere in the house. Learn about using neutral color palettes to give your Umbrian & Tuscan dinnerware the perfect backdrop! Understand what makes neutral color schemes look their best, and what happens when you inject 'real' color into neutral color palettes. It's FREE!! Return from Tuscan Dinnerware to Tuscan Kitchen Design. Return from Tuscan Dinnerware to the Dream Home Decorating homepage.